In the present day, money is a very basic requirement for carrying out exchange of goods and services in a particular market or a country or a particular socio-economical setup. That means there is a continuous demand of money to fulfil the needs of the populace for carrying out trade and commerce. To satisfy this demand the government or the money issuing authority of a country or an economy must maintain a continuous supply of money. The supply of money in an economy needs to be monitored and controlled since an excess or deficiency in money supply can lead to serious negative impacts on the economy. On the other hand efficient management of money supply can lead to economic growth. 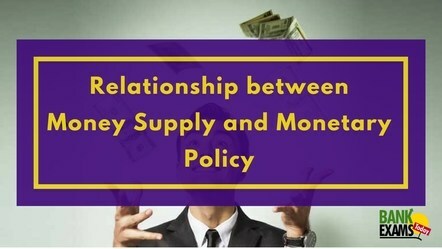 The policy for efficient monitoring and management of money supply in a particular economy is known as the monetary policy. Money is defined as any clearly identifiable object that is generally accepted as a payment for goods and services and repayment of debts within the boundaries of a particular country, a market or a socio-economic context. Money supply or Money stock is defined as the entire stock of currency and other liquid instruments circulating in an economy at a particular point of time. Money supply consists of safe assets such as paper currency, coins (i.e. currency in circulation), balances held in current and savings accounts (i.e. demand deposits) which businesses and individuals can use to make payments or can be held as short-term investments, and other liquid assets(cheques, demand drafts). The money supply of an economy is analysed by economists to develop policies for controlling the interest rates and to increase or decrease the amount of money flowing in that economy. Collection and recording of money supply data is carried out which is published periodically. This work is typically done by a country’s central bank or government. To gauge the possible impacts of money supply on price level, inflation and business cycle public and private sector analysis is also carried out and encouraged. The Federal Reserve’s policies are the most important deciding factor in US economy’s money supply. In India this job is carried out by the RBI in consultation with the Government. Increase in money supply in an economy typically lowers the interest rates, which results in more investment thus putting more money in the hands of the consumers, thereby stimulating spending and ultimately resulting in economic growth. (More spending means more demand ⇒ more goods and services are produced as businesses respond positively by ordering more raw materials and increasing production, which means increase in supply ⇒ economic activity increases). The opposite can also occur if the money supply falls or if its growth rate declines. Decrease in money supply in an economy typically prompts higher interest rates, which results in decline in investment thus sucking money out of the hands of the consumers, thereby dampening spending which might result in economic decline. (Less spending means less demand ⇒ less goods and services are produced as businesses respond negatively by ordering lesser raw materials and decreasing production, which means decrease in supply economic activity declines). Monitoring and management of the money supply in an economy requires knowledge of the real flow of money in that economy. To access the level of money flowing in Indian economy RBI now publishes five monetary aggregates following the recommendations of the Working Group on Money Supply: Analysis and Methodology of Compilation (Chairman, Dr. Y. V. Reddy) which submitted its report in June 1998. The 5 monetary aggregates are: M0 (Reserve Money), M1 (Narrow Money), M2 and M3 (Broad Money) and M4. Reserve Money (M0) = Total Currency in circulation + All Banker’s Deposits with RBI + Other Deposits with RBI. Narrow Money (M1) = Total Currency with the Public + Total Demand Deposits with the Banking System + Other Deposits with RBI. M2 = M1 + Total Demand Deposits with Post Office Savings Banks. Broad Money (M3) = M1 + Time Deposits with the Banking System. M4 = M3 + All Deposits with Post Office Savings Banks (excluding National Savings Certificates). The process by which the monetary authority of a country controls the supply of money in the economy is known as Monetary Policy. It is typically carried out by targeting the inflation rate or interest rates, buying or selling of government bonds (Open Market Operations or OMOs), and by regulating the amount of money banks are required to keep in the vault (bank reserves) to ensure price stability and public trust in the currency. Tools of monetary policy also include credit control policy, moral persuasion (morally persuading Financial Institutions to maintain a particular policy) and many other instruments. Monetary policy is the demand side of economic policy and is used by the government to achieve macroeconomic objectives such as liquidity, inflation, consumption and growth. It is instrumental in lowering unemployment rate, and helps in maintaining predictable exchange rates with foreign currencies. In USA, the US Federal Reserve is in charge of its monetary policy. In India the task is carried out by the Reserve Bank of India. RBI’s monetary policy is aimed at managing the flow and quantity of money in Indian economy to meet the requirements of the different sectors of our economy, thus aiming to increase the pace of our economic growth. Monetary policy can be of two natures: expansionary and contractionary. Increase in money supply and reduction of interest rates indicate an expansionary monetary policy or easy monetary policy or cheap monetary policy. Increases in money supply increases consumer spending, boosts business, lowers unemployment, boost private-sector borrowing, and stimulates economic growth. Decrease in money supply and heightening of interest rates indicate a contractionary monetary policy or tight monetary policy or dear monetary policy. Tight money policy is sometimes necessary in order to control inflation. But it can increase unemployment and depress borrowing and spending by consumers and businesses thus slowing economic growth. Liquidity (i.e. how easily an item can be traded for another item or into common currency within an economy) is a crucial factor for an economy to spur growth. For maintaining liquidity in the Indian economy, RBI depends on the monetary policy. RBI introduces money into the economy and reduces the interest rate by purchasing bonds through open market operations (buying or selling of government bonds). Failure of monetary policy can have detrimental effects on an economy and the society depending upon it. Such effects include: high unemployment rate, recession, hyperinflation, stagflation, shortages of imported goods, inability to export goods, and can even result in total monetary collapse. Such a failure and monetary collapse could lead to adoption of a much less efficient barter economy. For an instance, such a situation existed in Russia, after the collapse of the Soviet Union. Efficient management of money supply and a suitable monetary policy is of prime importance for the stability and growth of an economy.